Create beautiful stained glass projects in the classroom. 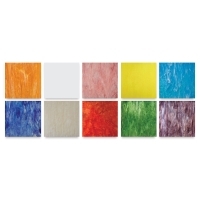 These bright, colorful 12" × 12" glass sheets are easy for beginners to cut. A variety of glass colors and styles are available to enhance any project. Each package contains 10 sheets, a total of 10 square feet. Note — Stained glass can be cut and used in mosaic projects, but it should not be used for weight-bearing works such as floor mosaics. 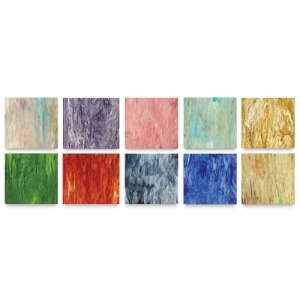 Opalescent and Cathedral Rainbow Glass Pack — A rainbow array of ten streaky opalescent and delightful cathedral colors. Variety Glass Pack — Contains a mixture of cathedral and opalescent glass including wispy, cloudy, waterglass, iridescent, baroque, and more! Cathedral Pack — Offers a rainbow of translucent sheets that are smooth on top with a light texture on the back. These colors will add shimmer and sparkle to any project. Art Favorites — This package has a little of everything, including opalescent, wispy, baroque, iridescent, and textures. A great selection of popular favorites.